A legal parade comprised of material witnesses, reams of documents and charts of phone data has reached its end. 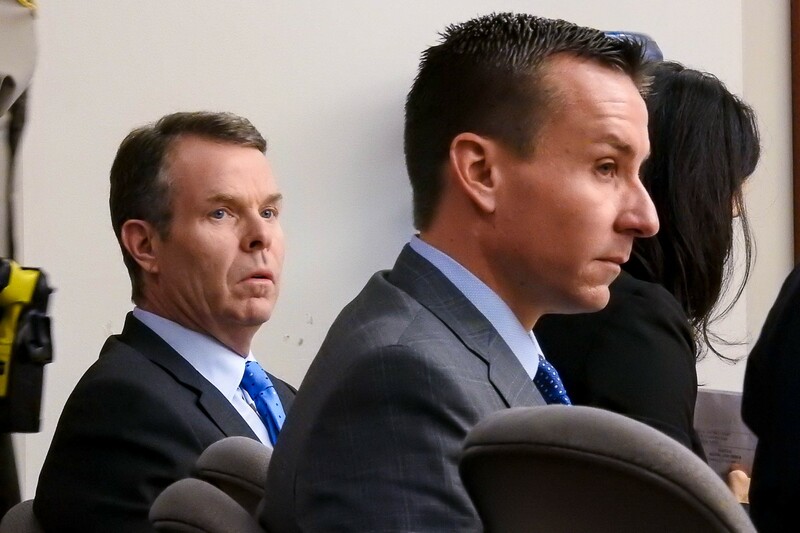 All the evidence that the jury will rely on to determine the guilt or innocence of John Swallow, who faces nine remaining corruption-related charges, has been introduced and offered. The former AG’s defense team rested Tuesday around noon and the prosecutors reported after a lunch break that it would not call any rebuttal witnesses. Jurors were excused for the afternoon and ordered to return Wednesday at 10 a.m., at which time the prosecution and defense will attempt to tie together or dismantle the state’s criminal theory. Only then will the jury begin its deliberation. By mid-afternoon, Deputy District Attorney Chou-Chou Collins dropped another charge, evidence tampering. This allegation related to Swallow asking the IT department to wipe data from an old computer after he took office in 2013. It was the fourth charge the prosecution asked the judge to drop since the trial began. 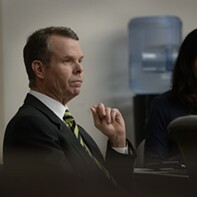 Lead defense attorney Scott Williams asked that another charge—Count 9, which claims that Swallow doctored a campaign donation form—also be dismissed. Williams put forth the case that reporting an amendment on a campaign report doesn’t rise to the level of altering, destroying or concealing evidence. That motion, however, was denied. As the trial resumed Tuesday morning, the defense called a handful of witnesses beginning with estate and trust attorney Lee McCullough. Around 2009, he helped Swallow set up a revocable trust for himself and another for his wife, as well as an irrevocable trust for the family, McCullough testified. At issue is whether Swallow lied about business holdings on his disclosure forms. 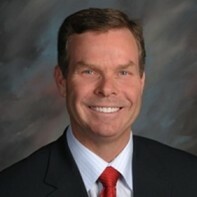 At the time he filed his candidacy, Swallow managed at least one limited liability company. McCullough advised Swallow as he filled out his documents. Because Swallow wasn’t the beneficiary—the trust was—he didn’t need to include it on the form, McCullough told him. At a later date, under McCullough’s guidance, Swallow’s wife was named manager of the LLCs. But McCullough testified that not only was the behavior legal, it was also ordinary. 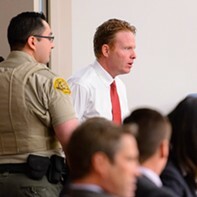 So routine was McCullough’s interaction with Swallow, that he couldn’t recall a few menial details. “It was very clear; It was very routine. I didn’t see anything controversial,” he said. Next on the stand, Gary Marx, a public affairs consultant who has worked in the political realm for decades, was presented as an expert witness regarding political fundraising and donation reporting. 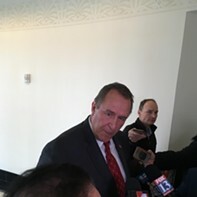 The defense relied on Marx’s remarks to counter the district attorney’s postulation of impropriety surrounding a fundraiser hosted by Tim Bell. Swallow reported $15,000 in in-kind donations from Bell but later amended his form to show a $1,000 donation. After determining the true amount to be north of $28,000, the lieutenant governor’s office ordered Swallow to change the form again. On questioning from the state, Marx told the court that he was compensated by the defense for his participation at trial. 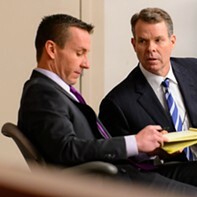 The defense attempted to demonstrate to jurors that communication between Swallow, former AG Mark Shurtleff and Shurtleff’s so-called fixer, Timothy Lawson, was not as extensive as other evidence had implied. Prosecutors allege the three men were involved in a conspiracy of corruption. Investigator Travis Peterson, who was employed for years as an investigator in the DA’s office and at the Sandy City Police Department before that, compiled data detailing the calls between Swallow and Lawson. Peterson produced a chart that depicted all texts, phone calls and voicemail communication between April 2009 and March 2013. It showed stretches of time with little contact. 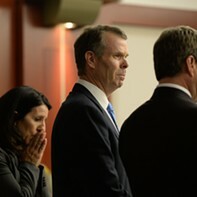 Before being halted by the prosecution, the defense tried to elicit testimony from Peterson that his former boss, DA Sim Gill, who was in the throes of an election, targeted Swallow and Shurtleff to score political points. Prosecutors intended to call a rebuttal witness, but Judge Elizabeth Hruby-Mills ruled on objection that the witness’s testimony—expected to offer an explanation as to why the telemarketing/coaching industry was heavily regulated—was not necessary and would only convolute things. Before it concluded, the defense called Francis Madsen Jr., a former chief of staff to Sen. Orrin Hatch, R-Utah, who consulted with Swallow in his unsuccessful 2002 bid for congress. 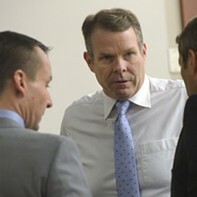 Madsen continued to share career advice with Swallow as the latter was offered a chief deputy position at the AG’s office.